Looking for a some serious statement making necklaces? I am loving these Sheer Addiction jewels. Currently stacking the "Asher" & "Courtney" on repeat. When J.Crew invites you for an evening of playing dress up in their new arrivals with fellow bloggers & cupcakes, you go. And then you Instagram the crap out of it... just sayin'. Row 1: dressing room selfies... duh! But seriously, the J.Crew Fall collection is the things my dreams are made of. Think lots of leather, bold colors, camo as a neutral, necklaces the bigger the better, menswear chic, & the uncanny ability that J.Crew has to constantly keep updating classics into totally covetable pieces season after season! What is your favorite piece from the J.Crew new arrivals? I went to my local J.Crew's Style Sessions as well. I'm amazed I didn't walk out of there with half the store. All of their Fall items are so gorgeous! Love this look! 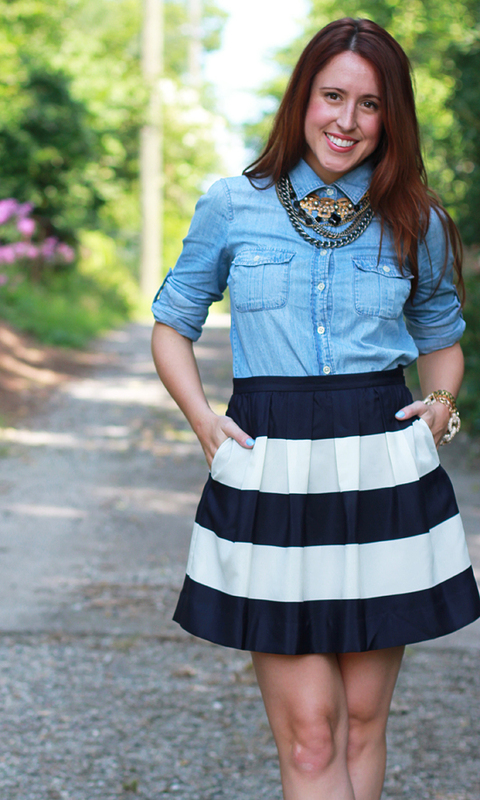 The chambray and stripes combination is perfect! Those pumps are seriously amazing!! And I am so obsessed with that skirt! That striped skirt is so cute on you! The JCrew event looks like it was a lot of fun! Love your skirt! And that J.Crew event looked really fun! I was loving all your Instagram pictures from this event!! Love the necklace layering you've got going on, very cute. I went to JCrew over the weekend and had to resist walking out with everything in the store. I LOVE this! I need this skirt in my life. I missed out on the J Crew Style session in Denver last week. I love going to those events. I love everything for fall. That vest is on point! Thanks for sharing! I have a shoemint credit and you just sold me on the "Bess" heels!! Super cute, love the necklaces. that looks like so much fun! i love the look of pumps + bold striped skirt! so classy. I already told you I loved your outfit on IG today, but now my life goal is to get invited to a J. Crew Style Sessions!! Or can anyone go? I went in today and almost keeled over. It's like they know I can't resist jewels on everything. Thank you lady! This skirt was such a happy find - those pockets! Thanks lady! I tried to restrain myself, but J.Crew pulls me in every time! I know right - they got it so on point this season! Oh yay! You are going to love them - they are surprisingly comfortable & I adore the classic shape in a new color! Aww, looks like so much fun. I'm jealous :P. You look lovely in that skirt! I adore your outfit! So perfect for "back to school." And your necklace layering is perfection! And I'm pretty sure I'm going to go broke thanks to JCrew! I am loving all of these pictures and I think I need those shoemint heels! I love the idea of stacking the necklaces, I'll have to try that. 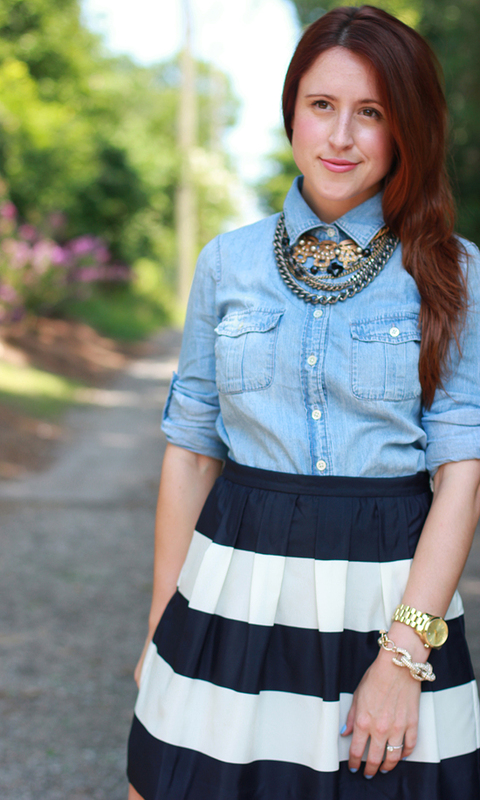 I'm still on the hunt for a good chambray shirt, a good staple piece for the fall!